A will is a document executed by the decedent during life that determines where the decedent’s property will go upon death and who should acts as the decedent’s personal representative. A will goes through a judicial process called “probate” during which creditors of the decedent makes claims against the estate. At the conclusion of the probate process, the assets of the estate are delivered to the decedent’s beneficiaries according to the will. Setting up a will is simpler and a little less expensive than creating a living trust. Creditors have cut-off date to bring claims against your estate, which they often fail to make. You can appoint a guardian for minors in a will. You do not need to transfer any property, to any entity, in order to make a valid will. Through probate, a will becomes a matter of public record. This probate process can be expensive and time consuming, and more often than not, it will not go exactly the way you had intended. A will does not allow for transfer of ownership for assets and/or property should you become physically or mentally disabled. Over the past 22 years, I have helped over 800 clients prepare and utilize simple and effective planning techniques to protect them and their families in order to avoid probate, save estate taxes, save money and save added emotional burden that comes from long term illness and/or death of a family member. Give us a call to schedule a free consultation to find out how we can help you and your family. With a Will, you have to probate your estate. 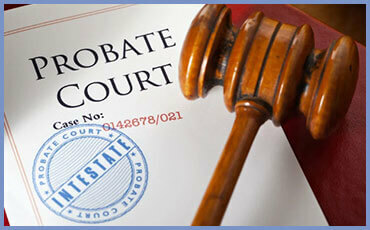 Probate is a formalized judicial process that certifies the validity of the Will. A Will must be probated with the Court before the executor has any power to handle the payment of bills and transfer of assets to the intended Beneficiaries. In the probate, the law requires proof and substantiation in order to have the Will admitted by the Court. The judicial process requires that all property of the estate that is not held in a revocable living trust (or other allowed formal designation) to be administered by the personal representative under authority of the law and court. All belongings of the deceased become a matter of public records as well as creditors of the deceased. Notice must be published in the newspaper and mailed to creditors. The homestead property of the deceased, realty, possessions, capital, and holdings must be inventoried. While it is true that a Will is a declaration of the intent of the deceased to choose and dictate their intention of how their assets are to be distributed, for most people with children and/or real estate, creating a revocable living trust is a better way to create certainty of their specific aim and purpose to make arrangements to take care of their family. With a little bit of forethought, you can be confident that your property and finances will be handled according to your design. When you choose who you want to be your successor trustee and then designate back-up trustees in case of certain events, you have assurance that who you designate will execute the specific action arrangement that you have predetermined. A revocable living trust is a confidential agreement that we create for you based on your direction to handle your future. One of the many advantages to a complete Peace of Mind Planning with the Law Offices of Christopher A. Benson, is that the plan goes into effect immediately and will also handle your future. Another benefit is that the assets placed in the trust avoid probate. Therefore, your property is not disclosed to all of your creditors and subject to being filed with the court. A trust assures that your private life remains private. You can decide and dictate you wish with discretion and choose the order to bequeath your possessions. A common misconception is that only people with a lot of wealth need a trust. That is a false perception. Trusts have been used by wealthy families for a reason — because they knew it made financial sense. Here is the good news for you: With our firm, we make Peace of Mind Planning available for everyone! We offer a free in-person consultation with Chris to discuss your situation, concerns, desires and family. I will work with you to put a plan together to accomplish your goals, handle your concerns, and give you Peace of Mind. Give us a call or send us an email with your questions. We offer simple solutions and fast results.